Previously, astronomers had been under the impression that the heavy elements—gold, platinum, lead, uranium, etc.—came from supernova explosions. But now, scientists have announced a new theory for these highly valuable elements, this one involving two ultra-dense neutron stars and one spectacularly violent, grossly expensive collision. Essentially, we're all here to today because some star somewhere in space exploded once upon a time. Down in the interior of stars, the high pressure and heat cooks up elements like carbon and oxygen atoms (the stuff we're made of). So when it inevitably comes time for that star to die, that explosion shoots out all of the ingredients for life as we know it. This explanation didn't, however, quite manage to explain where the more dense elements got their start. Because while the majority of light elements come with a fairly simple recipe, a heavier one like gold requires 79 protons, 79 electrons, and 118 neutrons—that's a hell of lot of ingredients. Which is why it takes these absurdly dense neutron stars, which come packing way more atomic supplies, to give us all those beautiful, heavy, glittering goods. When a massive star enters Type II, Type Ib, or Type Ic supernova—or in other words, when its core is essentially crushed by the force of its own gravity—there are two potential outcomes. It can either turn into a black hole or emerge from its supernova cocoon as a neutron star. To the get the latter, you'd need to start with a star about 4 to 8 times the size of our sun. Once the star burns off enough nuclear fuel to the point that the core can no longer support itself, gravity finally wins and collapses the core with enough force to cause protons and electrons to assimilate. Which creates neutrons. Which, as you may have already guessed, is where neutron stars get their name. So under most circumstances, these insanely dense dead stars will float around the universe doing no one any harm. But in binary star systems, the two are destined to collide. And this is what NASA's Swift space telescope observed during an all-sky survey on June 3. After seeing a flash of light called a short gamma-ray burst (GRB) far, far way in the constellation Leo, astronomers were quickly able to deduce (with the help of a few theoretical models) that what they were seeing was the radioactive afterglow from a gargantuan mass of heavy metals created in the wake of a neutron star collision. Previously, scientists had only been able to hypothesize that GRBs were the result of two colliding neutron stars, but now we have actual proof. When they make contact, several exciting things happen very quickly. Most of the material actually collapses to form a black hole. Some of the material then gets sucked into the black hole. That is the event that causes the gamma-ray burst. Some of the material gets spewed out into space. 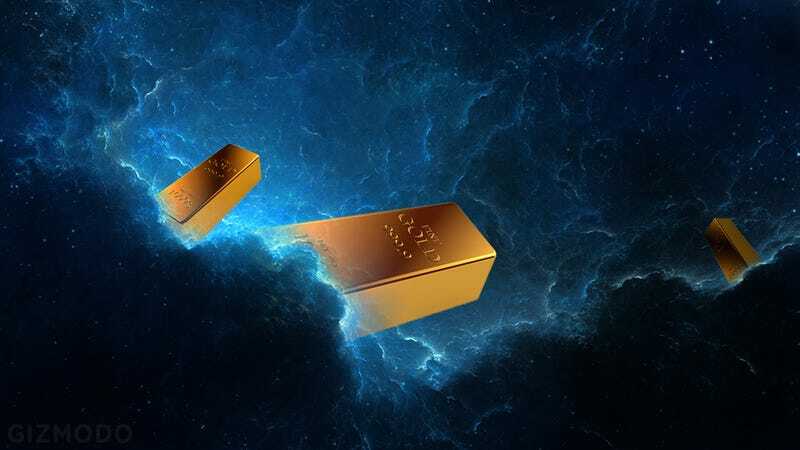 That material, since it came from neutron stars, is very rich in neutrons, and as a result, is very efficient at forming these heavy elements, including gold. And considering how many particles these neutron stars have pushed together (literally until they can be pushed together no more), it makes sense that two of them combined would be able to make quite a bit of gold—enough to equal about 20 times the mass of Earth, to be more specific. Which is also enough to fill around 100 trillion oil tankers. But hey, gold isn't everyone's thing. Neutron stars get that—they also produce about eight times that amount of platinum. Artist's impression of neutron star collision via NASA. But while mind-boggling in quantity, it's not quite gold as you imagine it; what you're getting from a neutron collision is atomized gold. It won't make it into your hands or onto your teeth (you do you) until it finds a big cloud of particles. These will eventually get shoved together by gravity and come out a beautiful solar system. Then, as the gold particles come together and the planet applies geological pressure, the particles will coalesce and, after about 1 billion years, become something you can see with your naked eye and subsequently covet.